Chain has been used in wastewater treatment facilities on various conveying and drives applications since the 1960s. The earliest types of wastewater chain used was cast material 400-class and 700-class series pintle chains. Since then, there have updates and improvements to the chains that are used in wastewater facilities. Stainless steel was later introduced and is the longest lasting wastewater chain available. Being manufactured from a combination of 300-series and 400-series stainless steel materials the chain offers excellent strength and outstanding anti-corrosive properties. 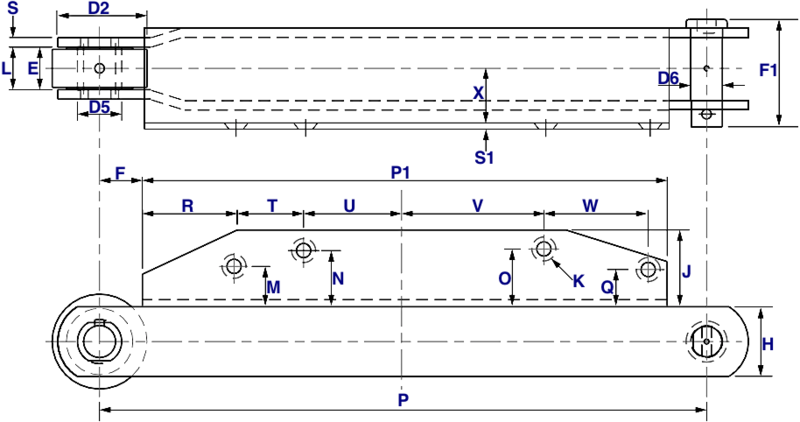 Typically there will be an SS, HB, MSS, or SAV in front of the chain size if it is made from a stainless material. Another update introduced in the 1980s was the use of welded steel chain in wastewater applications; currently, the only wastewater welded steel chain in use today is WH720S collector chain. Most recently, in 1990 the implementation of non-metallic Engineered plastic wastewater chain is used. This chain has the benefits of being light-weight, energy saving, extremely anti-corrosive, and high-strength. 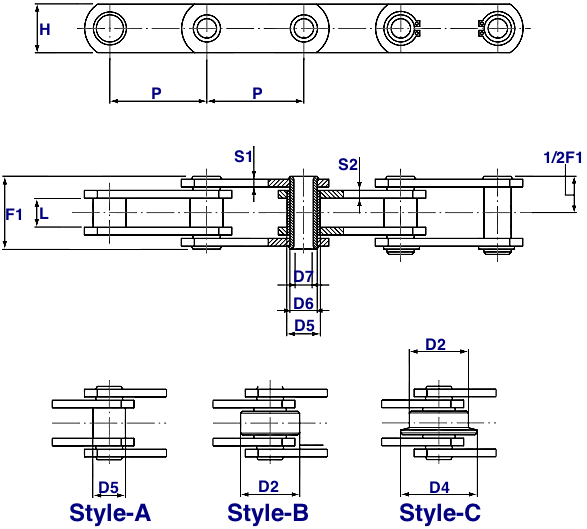 All materials are available in the conveying, collecting, and drive chain application sizes. Rectangular clarifiers are used in many water treatment facilities today due to their high-capacity, less short-circuiting, and smaller land imprint versus the center-feed/ peripheral overflow circular clarifiers (estimated 21% less). These systems use a drive chain and conveying chain with flights (scrapers) installed at a fixed spacing (typically 10ft/ 3 meters), this accomplishes both scum and sludge removal. We supply all associated components for complete chain replacement (including sprockets, bearings, pumps, motors, and reducers). The flights (scrapers) scrape the bottom of the tank and present consistent sludge which flows into the hoppers, we recommend using self-dumping hoppers for safety and improved productivity. When the flights travel to the surface of the rectangular tank along the collector chain, the scum and foam are pulled by the flights to the scum trough also known as a scum skimmer pipe. 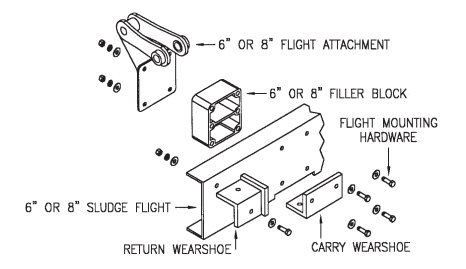 Generally, the chain and flights will move across the collector at a consistent 2ft (600mm) per minute. Note: Additional information and dimensions available on product pages. 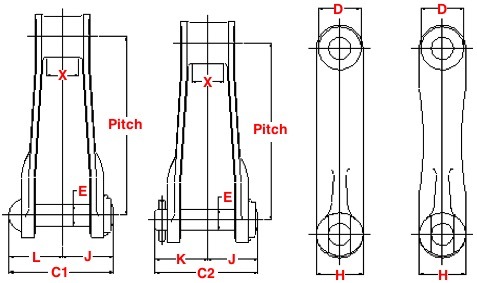 Drive chains are offset-designed and are what drive the whole system in rectangular clarifiers. These chains are made from non-metallic engineered plastic with stainless steel pins (PM, NH, or NM abbreviation) cast steel (H abbreviation) or stainless steel (SS, HB, or MSS abbreviation) depending on the strength requirements of the facility. Traveling water screen chains are manufactured in a way that allows for attachments to be closely spaced together and are a conveyor style chain. Typically these chains are available in zinc coated, stainless steel, engineered plastic, or a mixture of the three depending on the specific needs of the applications. 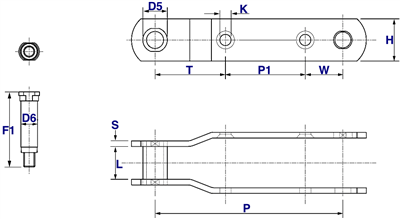 Hollow pin style chains offer a ready facility for placing attachments onto the outer plates through the hollow pin. 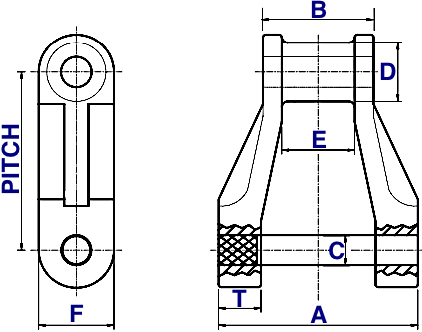 The attachments can be bolted up tight against the hollow pin rivet or left in a free manner to pivot. R1960H B 24.00" 4.00" 1.50" 1.75" 1.31" 1.21" 1.56" 3.00" 0.50" 4.13"
This type of chain has one of the most reliable conveying mediums in the industry, offering a combination of versitality, strength, and abrasion resistance. These chains. origionally of europian origin, are now established here in the USA and the rest of the world because of their highly-effective design and operation. With a wide veriety of materials, heat treatments, and flight formats the chain is proven in both drag an enmasse handling applications. 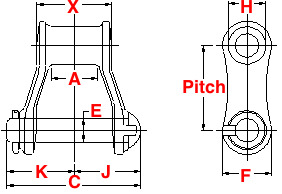 This series has a forged double clevis which a scraper can be mounted to and retained by a U-bolt or standard fasteners. This allows for some built-in clearance between strands which eliminates any potential problems that may be associated with a mismatch. Double series chains also allow an improved discharge when conveying sticky materials.